The WeMo Dimmer Switch is Belkin's best smart home product to date. It offers a sleek design, solid performance, and even Apple HomeKit support. If it's technical limitations aren't a problem, it's a great entry point for a smart dimmer. Belkin’s impressive line of smart home products dubbed “WeMo” has built a strong following over the years. They’re easy-to-use and can connect directly to your existing WiFi setup. 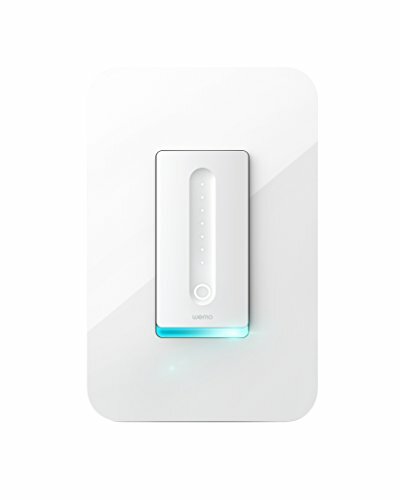 And from that line comes perhaps their most impressive product yet, the WeMo Dimmer Wi-Fi Light Switch. At just over $70, the WeMo Dimmer is a souped-up, more attractive version of the standard WeMo Light Switch. It features dimmable settings from 0 to 100, an app for remote control and scheduling, as well as the ability for voice controls through Amazon Alexa, Google Home, and even Apple HomeKit (the latter does require the Belkin WeMo Bridge). With it’s relatively easy installation and setup, it’s a great entry level dimmer switch. If I’m buying an $80 dimmer switch, I want it to look the part. And the WeMo Dimmer lives up to the price tag. The switch has an attractive, modern look that is accentuated by it’s screwless faceplate. The on/off button is located on the bottom and provides a tactile click when pressed. A multicolor light that gleams out from underneath the switch will flash when the light is turned on and act as a guide during setup and for troubleshooting. Perhaps the most impressive aspect is how the dimming is handled. A touch-sensitive groove runs across the middle that allows you to adjust the brightness by sliding your fingers up or down. Seven tiny indicator lights will show you what level you have your switch set at. The ability to set that brightness level before you turn on your lights is a great design choice by Belkin. Simply use your fingers to find the brightness level you want and then click the on/off button. This is great if you’re coming home late and don’t want to wake someone up but need just enough light to get around. As someone who is not that comfortable with electrical wiring, I found the switch relatively easy to install. The instructions are straightforward and the wiring is labelled so that even a novice like me could figure it out. The only issue I could see is it being a bit tight in the electrical box, but that’s the case with almost all smart light switches. There are some great tutorials you can find on YouTube that will walk you through each step too. Overall it took me about 15 minutes. Now there are two big flaws with the WeMo WiFi Dimmer Switch that you’ll want to know about before purchasing. The first is that it requires a neutral wire to work. Now this is likely only an issue in much older homes, but still something you’ll want to check before purchasing (if you don’t have a neutral wire, check out the Lutron Caseta Dimmer). The other is that the WeMo Dimmer Switch is meant to replace a single pole switch. This means it’s not compatible with 3-way switches (a set of lights that can be controlled by two different switches in the home). iDevices and Lutron both allow for this, so it’s a perplexing omission from a switch that has so much going for it. Now there are some advanced users who have found workarounds for this that can be found online, but I’d make sure you know what you’re doing before attempting it. Powering the Belkin WeMo WiFi Dimmer is the free WeMo app available for iOS and Android phones. It allows for the relatively pain free connecting of the device to your WiFi network (2.4Ghz only). It will not only control your new switch but any other WeMo products you might own. Inside the app you’ll find many standard features we come to expect. Besides basic on/off functionality, scheduling seems to be most important to people and dimming adds a nice twist to it. Not only can you set lights to turn on and off at specific times, but you can control what level they are at. The helpful Night Mode allows you to set the dimmer level for specific times of day. For instance I have my bathroom light set to a dim level between 11pm and 7am so that I’m not overwhelmed when I have to make a middle of the night pit stop. There’s some other great features packed inside the app as well. An away mode will randomly turn on and off the lights throughout the day to give the appearance you are home. Fade timers can be set to gradually fade out over a period of time. And the ability for long press controls (when you hold the on/off button it can perform a secondary task) adds for some additional functionality that can get really cool if you’re familiar with IFTTT. Overall the WeMo app is feature rich and functions well despite the occasional glitch. Updates seem to be pushed out on a regular basis which is a positive sign. And continued firmware updates give us a sense of security as well. Belkin has been quick to respond to vulnerabilities in the past. Belkin WeMo has long supported both Amazon Alexa and Google Assistant for voice controls. But now you’ll also be able to ask Siri to turn on your lights with the introduction of Apple HomeKit support. There is a catch however, you’ll need the WeMo Bridge to sync up to HomeKit. While we haven’t tested the Apple voice controls, we can confirm that they do work flawlessly through the Amazon Echo and Google Home device. There’s more to Belkin’s line than just voice controls too. Integration with Nest Thermostats allows for lights to be triggered when you are home and away. IFTTT allows for a slew of other triggers and actions that can even be activated with the long press that we mentioned earlier. Two months in and I’ve really enjoyed the comforts attached to a smart dimmer. I’ve been using one in my bedroom along with one in the attached bathroom. This allows me to get up in the middle of the night and turn on some pre-dimmed lights. My Amazon Echo Dot gives me voice control when I don’t want to touch the switch on my way out of the bathroom. Outside of a power outage that reset the WeMo Smart Dimmer, it’s worked flawlessly in the time it’s been in place. If you’ve got a single pole switch with a neutral wire, the Belkin WeMo WiFi Dimmer Switch is a perfect entry point to home automation. It is priced affordably, easy to install, and is the most attractive smart dimmer switch on the market. You can control through the WeMo app or give voice commands through your preferred smart speaker. And perhaps most importantly, it’ll connect directly to your WiFi which negates the need for an additional hub. It’s highly recommended to those looking for an affordable smart dimmer.